The Love Is The Law artwork is from 'Love Is The Law' (acrylic on calico with clay and epoxy resin, 28" x 28", 1996). "I'm not a Satanist, if that's what yer thinkin'. I'm aware of Aleister Crowley's slogans and a bit about him, but I don't agree with that much of it. But 'Love Is The Law' is a worthy sentiment, and I identify with the thrust of his philosophy that's opposed to organised religion and Christianity. But to treat him as a great figure, or to replace organised religion with worshipping the devil is just as much nonsense." "The only effect of their social action in the end, is to break up, throw out, destroy and raze to the ground to make way - for whom ? We need only look at who is holding the cord of this devastation. We say and we fear no contradiction - [it is] for the Antichrist. The Antichrist for us, is anyone who stands for a society in opposition to God or even one simply without Him. And whoever aligns with these people, or lends a hand and obeys them, makes way for the Antichrist, even if unwittingly." Aleister Crowley (1875 - 1947) was the Master Satanist of the 20th Century: "I simply went over to Satan's side and I do not know why . . . I was not content to just believe in Satan, I wanted to be his chief of staff." "Do what thou wilt shall be the whole of the Law" is an inversion of Saint Augustine's "Love, and do what thou wilt." The crux of Crowley's demonic creed was that each individual has no higher authority than their own will. Jesus Christ is the great Lawgiver. Satan is the author of the law of lawlessness, the total breakdown of all rule of law and all principle of law. Also known as both Frater Perdurabo and The Great Beast, Aleister Crowley was an influential English occultist, astrologer, mystic and ceremonial magician, responsible for founding the religious philosophy of Thelema. In his role as the founder of the Thelemite faith, he came to see himself as the prophet who was entrusted with informing humanity that it was entering the new Aeon of Horus in the early twentieth century. Born into a wealthy upper class family, as a young man he became an influential member of the esoteric Hermetic Order of the Golden Dawn after befriending the order's leader, Samuel Liddell MacGregor Mathers. Subsequently believing that he was being contacted by his Holy Guardian Angel, an entity known as Aiwass, whilst staying in Egypt in 1904, he received a text known as The Book of the Law from what he believed was a divine source, and around which he would come to develop his new religion of Thelema. He would go on to found a new magical order as a successor to the Hermetic Order of the Golden Dawn, the A∴A∴, the Argenteum Astrum, or the Silver Star; a silver star, in the form of a sheriff's badge, forms the centrepiece of the Love Is The Law artwork, denoting the enforcement of love as the law. Crowley eventually rose to become a leader of Ordo Templi Orientis (O.T.O. ), before founding a religious commune in Cefalu known as the Abbey of Thelema, which he led from 1920 until 1923. After being evicted from Cefalu he returned to Britain, where he continued to promote Thelema until his death. Crowley has been an influence for a string of popular musicians throughout the 20th century. The Beatles included him as one of the many figures on the cover sleeve of their 1967 album Sgt. Pepper's Lonely Hearts Club Band, where he is situated between Sri Yukteswar Giri and Mae West. A more intent interest in Crowley was held by Jimmy Page; despite not describing himself as a Thelemite or being a member of the Ordo Templi Orientis, Page was still fascinated by Crowley, and owned some of his clothing, manuscripts and ritual objects. During the 1970s, he bought Boleskine House, which also appears in the band's movie, 'The Song Remains the Same.' David Bowie too became immersed in his work in the 1970s ("I'm closer to the Golden Dawn, immersed in Crowley's uniform of imagery", 'Quicksand' from the album 'Hunky Dory'). The signature riff may emanate from 'What Is Life' by George Harrison, from his 1970 solo LP, 'All Things Must Pass'. After a Chestnut Mare middle eight, the guitar workout raids Led Zeppelin's back catalogue. Compare 5.09 - 5.18 of Love Is The Law to 3.05 - 3.18 of 'Whole Lotta Love' (Squire's guitar 'scraping' here recalls that of Page on that song's breakdown section). Squire later diverts to the riff from 'How Many More Times', from 'Led Zeppelin I'; also discernible is the influence of 'Heartbreaker', from 'Led Zeppelin II'. 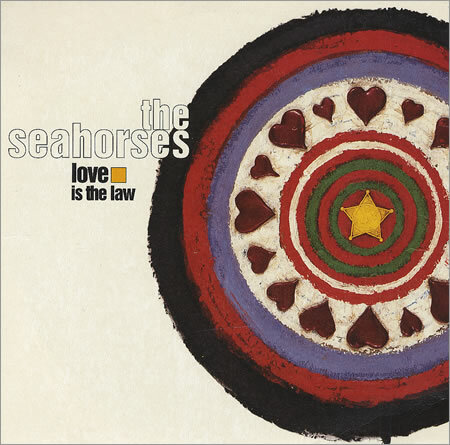 Left: Love Is The Law cover artwork, which adorned the front of Andy Watts' bass drum on tour. The five pointed star, with a circle in the middle, and the circle is red. 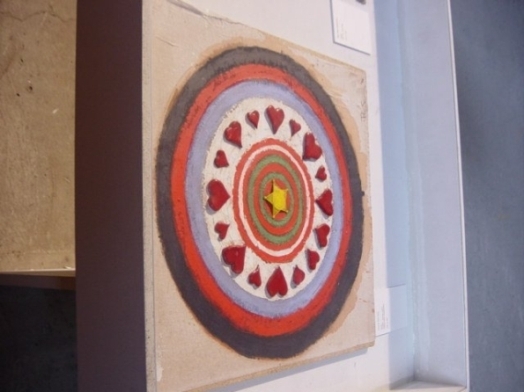 Right: 'Love Is The Law' (acrylic on calico with clay and epoxy resin, 28" x 28", 1996), from the Manchester exhibition, May 2004. "It is what it is. Fairly literal. Sheriff's badge and hearts. I took an old bike frame my Dad had renovated for my Mum - but she doesn't like cycling or staircases and it turned into a rusting hulk. So I threw it outside my house, put the wheel in a vice on a bench, put a board on top of that. Lots of cranking round. Very time consuming." (John Squire speaking to Select Magazine, November 1997).